And so it sits today. But I’ve survived for over two years while some other businesses have failed. What’s my secret? At each stage I’ve been very conservative and expanded only when absolutely certain my revenue greatly exceeded the monthly expenses. That and all the customers who come by to look and purchase. My thanks to all of you! Meanwhile in SL, Apollo simulation is a fascinating exhibit, because it is always changing as the maker implements enhancements. In this view, Radar Masukami and I have successfully flown the Lunar Excursion Module down from orbit to the surface of The Moon. Erm, you might be wondering why there is a Joshua Tree on the barren, airless Lunar surface. Well, that’s because the landing area was (at the time of our flight) simply a sandbox below the orbital area, not yet fully moonscaped. This also explains why we are able to successfully walk on the surface without space suits. But we had to wear our Trek outfits, of course. Long ago I watched a particularly frightening (at the time) episode of the classic TV series, “The Twilight Zone”. 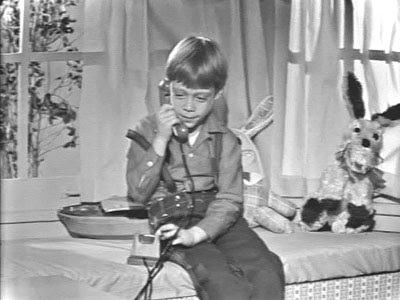 In the episode “Long Distance Call”, child actor Billy Mumy uses a toy telephone to call his newly dead grandmother. The situation seemed normal from the child’s viewpoint, but when the father picks up the toy phone and speaks to the dead grandmother over some unimaginable series of wires and switches, the situation becomes infinitely not normal. And pretty scary, too. I had the same feeling as that TV father last week. I had that feeling while testing the new AvaLine voice service just introduced for testing by Linden Lab. 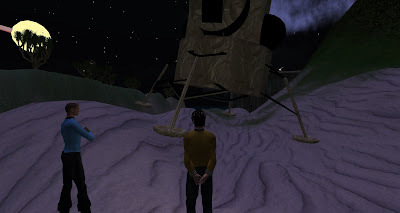 It’s a service that permits people (not necessarily avatars) to use their familiar telephone to call directly into Second Life and speak with a logged-in avatar. Or if they’re not logged in, you can leave an audio voice message, which shows up as an MP3 file in the avatar’s email. AvaLine is pretty straightforward to use. After signing up and getting your AvaLine "ID", you exchange it with your avatar friends. Then you pick up a normal telephone and dial one of several strategically located telephone "portals". The portal asks you for the avatar ID, and upon receiving it, connects you to the selected avatar in voice. The audio quality is inconsistent and typically worse than normal avatar-to-avatar in-world voice (assuming all are using headsets with reasonable quality mics). My goodness, it sounds like they’re on the telephone! D'oh! That’s another major problem: the actual real-life telephone number is shown. For those who wish to be anonymous, this could be a big issue. I don’t know if it’s possible to block the caller ID, but the truth is that many people wouldn’t realize they could do so and thus mistakenly reveal their True Phone Number. If the avatar is offline, then the message goes straight to voice mail. But this also occurs if the avatar has set the “Only accept voice calls from people on My Friends list” option. You must turn this off to receive calls from your friends, because the system doesn’t know your friends' telephone numbers. Yet. Real life telephone calls seem to have an “I talk, You Talk, I talk” protocol. But SL conversations seem different, and involve more passive listening and pauses. Pauses, though normal in SL voice, are very unnerving when you have a handset to your ear. I’m not sure this is a situation many would find themselves in, but I suppose it does occur. I’ve used it a few times and it is fun, but I am not sure it would survive past the novelty stage for me. There would be more use, I think, if avatars could call out to any outside telephone number, but that feature does not currently exist. But back to the Twilight Zone. In the course of testing AvaLine, I found myself in my real-life office, looking out the window at real trees, real buildings and real people walking by. I saw my hand pick up the telephone and dial a sequence of digits. Soon, ringing. Suddenly a voice answered. A voice from another world. And it really was from another world. My mind swam as real and virtual contexts violently collided, leaving me quite uncomfortable. I thought of the boy speaking to his dead grandmother and realized that was no boy; it was, and is, me.